The sock in the dryer: Beach Erosion isn't ALWAYS a bad thing . . . I can't think of a single instance before today when yours truly ever had anything positive to say about beach erosion. 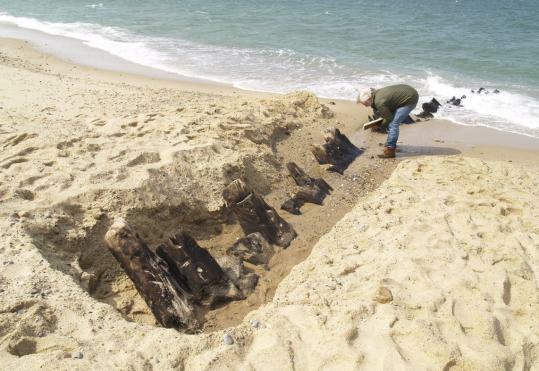 But, recent storms along the Cape Code National Seashore have worn away enough sand to expose the wreckage of 231+ year old British warship: HMS Somerset III. If the name doesn't ring a bell for ye socks, don't feel too bad. I'd never heard of it before, either. But, according to historians it was this ship that Paul Revere had to evade on his historic ride, during which he warned his fellow patriots, "The British are coming, the British are coming!" The poet Henry Wadsworth Longfellow immortalized said ride by Revere, but only alluded to the lurking maritime threat. He never actually named the ship in his famous poem. Anyway, it turned out that HMS Somerset III sank off Cape Cod back on 2 November 1778, with four hundred British troops on board. Thirty-seven years ago, another bout of beach erosion revealed the ship's wreckage. Now, it has resurfaced, and technology has advanced to the point where an extensive survey can be made without disturbing the vessel's remains. The researchers better work quick, though. It won't be long til the cape sands cover up the timbers again, and they might have to wait another 37 years to get another opportunity to pick over the remains . . .